They blend very nicely in with the new logo, don't you think? There's still a lot more icons needed. If you are interested in helping with this, you can contact the STK crew beforehand to get some advice on what we're looking for, and avoid duplicating work. Eventually, if you're comfortable with it, you can get the latest SVN version of SuperTuxKart and find one/several icons you want to improve. Most icons, excluding the new main menu ones, are only placeholders until we get something better. 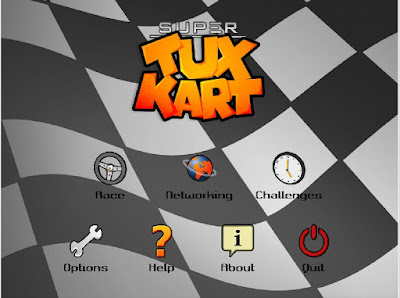 Note: As the "STK w/Irrlicht" branch is still in a very unstable state, the general public is recommended to use the latest stable version (0.6.2) of SuperTuxKart. I like them, specially the first one, the one for "race". But I wonder if those icons come from an SVG source, or are just PNGs, because in the screenshots it looks like they don't come from SVG, which would be a problem in big resolutions. Very, very nice. I don't know why, but I like the orange. Even though I normally hate orange. Must be STK7's ability to make everything it touches awesome. I can't help noticing the 'Network' icon on the screenshot. Does that mean LAN or full-on online play? I'd like to commission the rest of these icons (or at least some of them). Can someone please provide a list? Edit: A binary for Solaris has been made by xeno74, and it can be found at the SourceForge download page.